“Standing at the altar with @TracyPage where just a second ago, she became my wife! Gotta go, time to kiss my bride. #weddingday”. 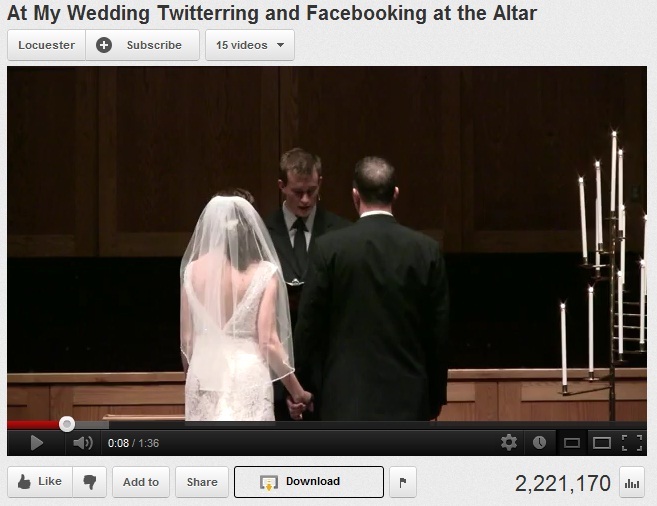 Dana’s wildly popular wedding video [2,221,170 views so far] evoked extreme responses from people all over the world. While several denizens of the networked world rah-rah ed over those gooey gestures of geek order, several pundits decried the death of marriage institution, having witnessed the desecration of the holy altar by a social networking addict. Your reaction to this incident could be either agony or ecstasy depending on how much you relate to social networks influencing your social life. For the sake of clarity, let me add, I am referring to the social life which happens in the real world, where human relationships are quite messy and uncategorized, beyond the simple drop down menu offered by Facebook comprising 11 relationship statuses. So what does it mean to lead a social life? When the earliest humans came in close contact with each other for the first time during the Ice age, they carried social symbols which gave them their social identity, limited to their immediate surroundings. Prehistoric women wore stonejewels which indicated their social statuses, with clear demarcations over their social class and community. Fast forward several thousand years which witnessed tremendous advances in science & technology. We started creating alternate social identities, built across the border-less world, in an attempt to mimic and influence our real social lives. So what? Isn’t it a good thing? You may ask. After all, hasn’t it provided voice to millions who were denied one until few decades ago? Dictatorial regimes were overthrown and Gandhi’s old platitude about customers finally became a truism. Customer is the real king. It cannot be denied that the power of networks has disrupted the edifice of our social beliefs, ordained by institutions which governed human lives. However, this isn't the complete story. We are yet to grapple the far-reaching consequences these technologies are changing not just what we do, but who we are. We are asking for trouble when we are unaware that our virtual social lives are not just influencing, but substituting our real social lives. If you are an active user of social networking sites, reflect on these questions without judging yourself. 1) Have you ever noticed that social networking has been an undercurrent activity as you proceed through your everyday business? 2) Have you ever noticed your mind verbalizing your status message when you are eagerly anticipating a specific event/moment of your life? 4) Have you ever noticed the strong urge to mentally a mark a picture to share it in social networks while your friends are clicking it? Do you specifically ask your friends to take a picture meant for social networks? Few years back, I wrote a blog post on the connected age where I talked about, what Emily Nagle Green, in her book, Anywhere, mentioned as location paradox inherent in the connected age, which makes location both significant and insignificant. As I reflect on it today, it seems I have missed a critical point. Today's anywhere technologies have dissociated location from the activity. This behavior can be seen everywhere as we are busy multitasking several activities with no regard to the place where we are at the present moment. This has led to a distorted perception over the purpose of a certain place. The wedding video proves to be a classic example in this case. So what is the solution? Sherry Turkle, in her must-watch TED video on this subject,asserts the need to create sacred spaces, specifically meant for a certain activity. Such sacred spaces can be maintained at homes( kitchen, dining room) and offices( meeting rooms). This is definitely not an attempt to stop the use of social networking sites. They have indeed become an integral part of our social lives. However, we might have to remind ourselves that we still have the choice to be self-aware of how we relate to these technologies to enhance the quality of our lives. Thanks Navin! Would love to hear your thoughts as well!